Genre art uses spectacle to convey in images what words alone can’t. That’s baked into the premise of genre from the start. In real life we’re not going to be eaten by a zombie horde, burned by a swooping dragon, abducted by alien spacecraft, or caught up in a major musical number. Nevertheless, zombies and dragons and aliens and big song-and-dance routines that end with an entire street full of people doing jazz hands toward a crane-mounted camera help us articulate the big ideas and emotions we do experience in real life — terror and awe and rage and passion and joy — but lack the commensurate vocabulary to describe. If The Act has a claim to greatness this early in its run, it’s because it understands how this works, even within the relatively realistic genres of crime fiction in general and true crime in particular. Gypsy Blanchard is a real person, and Dee Dee Blanchard was a real person too. Real people like you and me may not have been part of a sordid and tragic story of abuse, deception, and murder that captured the imagination of millions, but the odds are good that we are familiar with abuse, deception, tragedy, and death, and perhaps in our worst moments even the desire to cause death. Maybe we didn’t experience these things at the scale the Blanchards did. But in the moment, did they feel any less intense, overwhelming, disfiguring, spectacular? Directed by Laure de Clermont-Tonnerre from a script by Dan Deitz, “The Body” contains at least three spectacular moments that communicate Gypsy Blanchard’s plight more effectively than mere recounting ever could. By scaling her pain upward with sight and sound, it paradoxically makes her experiences more relatable, not less. The throughline for all three is the fate of Gypsy’s teeth. Having spent her life believing more than a taste of sugar would kill her, she learned in the series premiere that she’s not allergic at all. But upsetting her mother by confronting her with this accidentally gleaned knowledge would, for someone raised in Dee Dee’s two-person world, be a fate worse than death. Yet continuing to deny herself a pleasure she can feel in her bones is hers by right is unbearable. So Gypsy starts sneaking sugar by the pound and liter every night after Dee Dee goes to bed. As makeup tutorials, which present an aspirational vision of young womanhood that contrasts with the relentlessly childlike world of her home and her hospital rooms, play on her computer, she chugs soda, wolfs down junk food, and just generally dares to indulge a desire other than to please her mother. But this behavior has a consequence: Her teeth rot until they fall bleeding from her mouth. It doesn’t matter that she stops due to a pang of guilt that hits her when she discovers she’s up for a Child of the Year award from a local charity. (“It’s not just for billionaires to feel better about themselves,” says a speaker at the ensuing philanthropy gala, which, LOL.) The damage has been done, and it’s lying right there in the bathroom with her bloody toothbrush. It’s a painful image, visceral and disgusting — and familiar to many sufferers of bad dreams, or enjoyers of artistic interpretations thereof. It’s a spectacular representation of everyday anxiety, shame, and fear of failure, scaled up to match the severity of Gypsy’s situation. It gets worse. Dee Dee discovers her daughter’s dental problems and springs into action, just as you’d expect. But she has an unerring instinct for exploiting the better angels of people’s nature, including her own, to feed her own mental illness and enable her abuse of her daughter. Think of how she took advantage of her neighbor Mel’s contrition over trying to exclude her from the local in-group last episode to deflect from her shoplifting and general dishonesty, or how she flim-flams a family services agent this episode by playing off her desire not to cause further stress to a child she paints as developmentally disabled. So instead of getting to the bottom of Gypsy’s actual problem — which would, after all, necessitate acknowledging that Gypsy has begun carving out a life of her own — Dee Dee concocts an alternate theory of the ailment, acid reflux, and presses forward with it no matter what. This leads to the second major spectacle: the forcible extraction of Gypsy’s remaining teeth. Dee Dee and the dentist spring this on her just before she goes under and the dental drill starts screeching. When she wakes up and looks in the mirror, a rictus of grief and pain spreads across the bruised and swollen surface of her lips and cheeks and chin. Her mother’s attempts to soothe her by bathing her like an infant, assuring her that she’ll be taken care of like a baby bird, only make matters worse. But the show must go on. Dee Dee insists on plowing ahead with their appearance at the Child of the Year ceremony, piling colored tulle fabric on Gypsy’s shaved head while fantasizing the beauty of the moment. Then comes a highlight in Joey King’s already extraordinary performance: “My teeth! My face!” she sobs, in the high, slow whining voice of a child who’s just learned something terrible, distorted by her toothless lisp. I wouldn’t be surprised if this was a tap-out point for some viewers. It’s very, very hard to see and hear. Even in a pre–Leaving Neverland world, this song in this context comes freighted with darker overtones. Whether your focus is on the abuse Michael Jackson allegedly suffered at the hands of his own stage parent, or the abuse he allegedly wrought on children trapped within his own infantilized private world in turn, the parallels are … Jesus, I don’t know what to say. It’s hard, hard to watch and to hear. King and Patricia Arquette sing it to each other, slightly off key, with an intimacy so uncomfortable it feels like nakedness you need to cover, like Noah’s Old Testament sons. Some people, at least, are starting to see this for what it is. The Blanchards’ neighbor Lacey (AnnaSophia Robb) has become something of a confidant to Gypsy with regards to her secret snacking and Facebooking; after the murder, she passes this intel along to the police, their first indicator that all is not as it seems. And actor Poorna Jagannathan puts in strong, subtle work as Dr. Lakshmi Chandra, the one hospital employee sharp enough to notice something is off about Dee Dee’s shifting stories and Gypsy’s countless symptoms, and determined enough to do the legwork necessary to sniff it out. 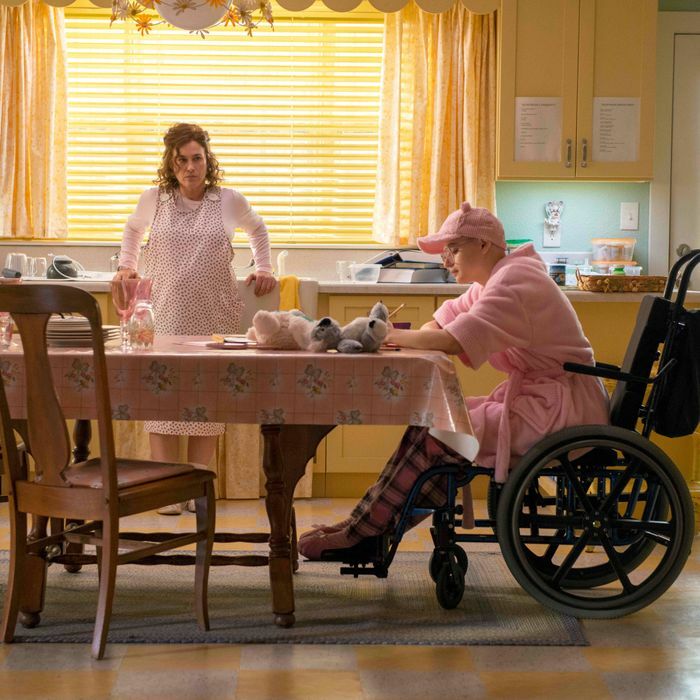 But both these women are limited in what they can do for Gypsy in the moment — or for Dee Dee, whose fear for her daughter is not fake even if everything else is. The Blanchards are trapped in that fantastical, spectacular world, where cursed mirrors reveal the faces of disfigured princesses maimed by their wicked queens, who then morph into fairy godmothers who can cure them with a smile and a song.